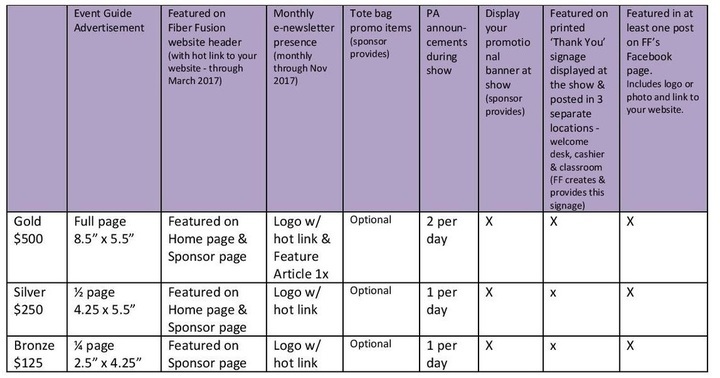 Sponsorships are vital to the continued success and growth of Fiber Fusion Northwest. We appreciate the support of our sponsors to help make it happen! Thank you for considering supporting Fiber Fusion Northwest with the purchase of a sponsorship. Fiber Fusion is 100% volunteer organized, does not charge admission, and we strive to keep our class costs as low as possible. As such, sponsorships and advertising dollars are vital to our continued success! Featured on Fiber Fusion website headers on Sponsor page. here to download a copy of our Sponsorship Form to mail with your check.